where is that image from! i want to read the whole comic/cartoon, it looks really interesting. also stop posting about events in san francisco; it keeps making me want to move there! Yeah, I forgot to add the caption (as well as the image description) when I posted this last Friday — I had been waiting for some interview answers from Iraya Robles, and when they didn’t come in (of course she was too busy organizing the event!) I had to throw this post together at the last minute before taking my daily leave of the Internetz. 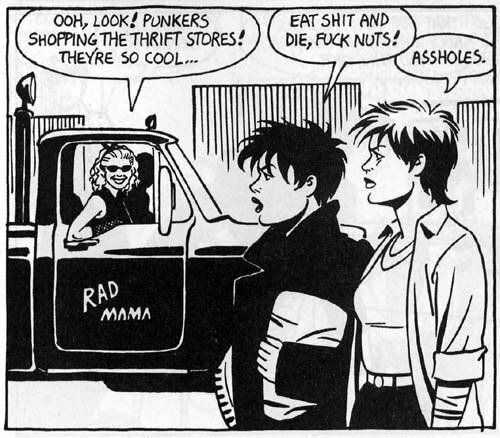 It’s Jaime Hernandez, and the long-running comic book he writes and draws is called Love & Rockets. I’m not sure what issue this panel hails from, however!